If you’ve ever used a mouthwash, you might have realized how fresh it makes you feel. However, using it properly is important. Choosing one is also important. There are cosmetic mouthwashes as well as therapeutic ones. Cosmetic mouthwashes only mask bad breath but don’t treat it, whereas therapeutic ones have some healthy effects on your oral cavity. Once you choose a correct one, you have to use it once before or after brushing every day or as per the directions of your dentist. Here are a few steps to properly choose and use a mouthwash. As mentioned earlier, a cosmetic mouthwash only masks bad breath, but doesn’t treat it. It’s good for rinsing mouth after you eat a pungent meal. Therapeutic mouthwashes kill bacteria that create bad breath, treat gingivitis, reduce plaque, and sometimes may even whiten teeth. If you need a mouthwash that will actually clean your mouth, it’s recommended to choose a therapeutic mouthwash that will kill the harmful bacteria in your oral cavity. It should be labeled as antibacterial or antiseptic. However, remember that some antibacterial agents like cetylpyridinium or chlorhexidine may discolor your teeth. Also, an antiseptic mouthwash stops growth of bacteria and also viruses, protozoa and fungi, but contains a lot of alcohol, due to which your mouth becomes dry and irritated. 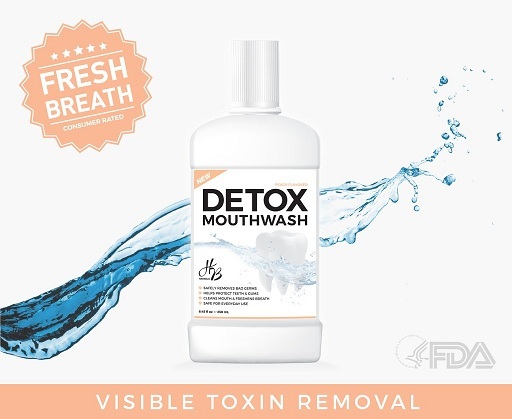 Detox mouthwashes like Haring B detox mouthwash clump together harmful bacteria (including S. mutans) and dispose them of so that you can actually see them. Haring B also contains powerful natural antimicrobial agents including licorice and green tea extract. If you particularly want to prevent cavities, it’s recommended to use fluoride mouthwashes. They help reduce lesions that result in cavity formation. Fluoride is present in most toothpaste and is also added to the water in many places. But you may also consider additional fluoride if your teeth are prone to cavities. However, remember that according to some scientists, fluoride can be toxic to body as well as environment. First read the label on your mouthwash to know proper dosage and pour the proper dosage in a cup. It may come with a small cup in the form of the bottle’s cap and you can use it to measure the correct dosage. Or you can use another small cup. Take mouthwash into your mouth. Never swallow it. Swish it through your teeth for 30 seconds to a minute and then spit it out. Follow the directions on your mouthwash regarding how long you should wait after this for eating or drinking water. Choose the correct mouthwash, use it properly, get rid of bad breath and microbes, and enjoy a fresh, clean and healthy mouth.